This little Merman is based on a design by Cody Williams, Cody made a merman based on the character 'Gil' from the children's TV show 'Bubble Guppies'. Now I have never heard of the Bubble Guppies and I am not too sure if we get it here in the UK, maybe its on some random sky channel? anyway, I liked the design but ended up making a few changes, I had to change the body as I didn't have any the balloons Cody used and I changed the tail just because I preferred a different style. Thanks for the design Cody, he is brilliant. 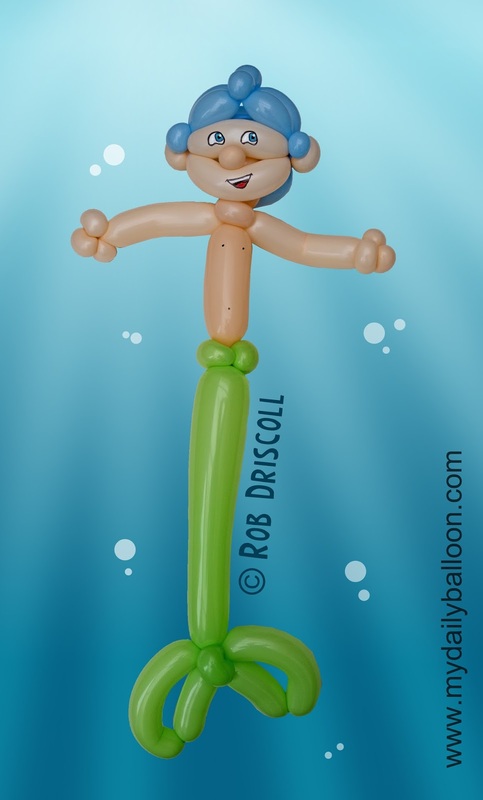 He is made from 6 balloons, a mixture of 160s and 260s. You can keep up to date with all the latest news and sculptures by heading over to Facebook -www.facebook.com/mydailyballoon and hitting the 'like' button, then feel free to share it with your friends.